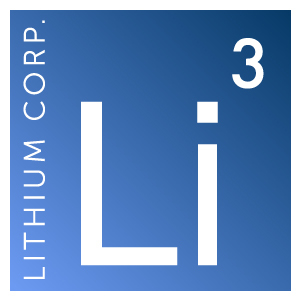 Elko, NV – October 26, 2017 – Lithium Corporation (OTCQB:LTUM) (“LTUM” or “the Company”), a North American company focused on energy metals for the growing energy storage sector, and high tech industries is pleased to announce that it has recently excavated a “mini bulk” sample at the Company’s BC Sugar flake graphite prospect in British Columbia. This sample has been submitted to SGS Lakefield’s laboratory in Burnaby, BC. Trenching on the prospect in the area of the “Weather Station” showing in 2015 intercepted a broad zone of mineralization with a core area of almost 30 meters where weathering was as deep as 8 meters subsurface, and average grades were 2.73% graphitic carbon. After establishing that weathered, easily extractable graphite mineralization exists on the property; the Company is looking to determine how amenable this material is to processing, and what the size distribution and other properties of these graphite flakes are. Typically larger, flat flakes that are purer tend to command a better price than those that are smaller, somewhat bent, and/or contain inclusions or impurities. This work is anticipated to take up to two months to complete, and will be summarized by a short report from the lab. Elsewhere in British Columbia, Lithium Corporation has ceased work on the Bormal option properties, and is currently awaiting final assay results from these exciting new Rare Earth Element/Tantalum-Niobium prospects. These results will include further assays from a zone discovered in July of this year where initial assays indicated Total Rare Earth Element (TREE) content was up to 0.75%.